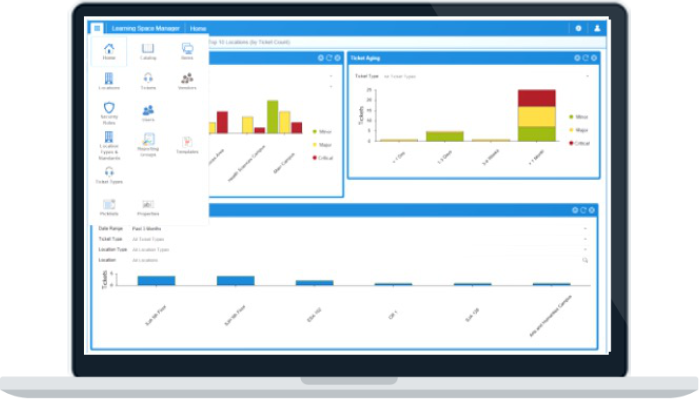 True cost savings through real-time, powerful budgeting reports, incident and asset management, and end-of-life replacement reporting with actionable recommendations that align with your institution’s goals. No more waiting for room access … perform your assessment virtually. Design and upgrade learning spaces visually from your laptop or mobile device. Securely collaborate with internal and external partners, as well as industry peers. Fast time to value with concierge style customer service support at every step to get you up and managing your learning spaces quickly and confidently. Complement your generic ticketing and/or asset management systems to accelerate modernization of your learning spaces to meet the needs of today’s learner. With Learning Space Manager unite your institution’s asset management and transformation goals under one cost effective service. The synergistic approach of the service unites data related to locations, technology and service combined rather than managing individual audio visual and technology assets. Learning Space Manager goes beyond asset management and ticketing and connects locations, technologies and people. Who benefits from collaborative learning space management? Ultimately the students. When IT, AV, Facilities, Academics, Scheduling and Vendors are empowered to collaborate, amazing things are achieved. With Learning Space Manager, you are wisely investing in your institution’s future. Leading higher education institutions trust Learning Space Manager as their learning space experience solution. Contact us for a free demo and we’ll contact you shortly.